The term itself needs little explanation. Everybody is aware of what it conveys and basically understands it to mean that a record (or TV show, movie, etc.) has commercial success with some definable standardized measure. Within that term are some distinctions of course that further delineate just HOW successful they are in relation to one another, but all of which are still classified under the larger “hit” banner. Once you’ve gotten that designation for the most part it sticks. Now down the road we don’t always remember what was and wasn’t a hit (did The $64,000 Question really unseat I Love Lucy as the Number One program for 1956 – the only show to beat Lucy after its first season? ), and in many cases we don’t really care years later that Three Men And A Baby was the top box office earner in 1987, for that doesn’t make more of a classic movie than Platoon. But music… well, music is different… to a point. In music hits are largely what are used to write history, at least as a starting point. Hits not only tell us what the audience was interested in at the time but also what was likely to be heard tomorrow as record labels, producers, writers and artists chase the sound that has the most appeal. So while hits don’t tell the whole story, and are by no means a validation of records from an artistic point of view, when looking back at history and wanting to understand what happened and why it at least helps to be able to determine what was a hit at the time and go from there. Enter Billboard magazine, the leading trade paper which determined hits through various surveys and published those figures each week. The fact that Billboard magazine continues to exist and does the same thing today as it did more than a half century ago (albeit using changing methods of tabulation) gives it a permanence that adds to its historical legitimacy, provided we know the occasional flaws in the system to account for them. For instance: Rock ‘n’ roll from 1947-1954 had virtually no penetration into the white marketplace. Rock was originally black music for black audiences and thus there was hardly any notice of it on Billboard’s Pop Charts. So instead we turn to what were originally called the Race Charts or later Rhythm & Blues Charts to determine which rock songs and artists had the most appeal during those years. Likewise we know that in 1964 Billboard did away with the R&B Charts altogether thinking they’d become too similar to the Pop Charts, an indication that true musical integration had occurred thanks to rock ‘n’ roll and thus those separate charts weren’t showing anything significantly different (because the magazine itself failed to focus on the specific black audience within the growing integration of the broader overall popular music audience). So for 1964 the records of what was a hit with that segment of rock fans was for years seen as being incomplete. One of the more recent efforts to fill in that blind spot in history has been the renewed focus on Cash Box’s R&B charts for 1964. Cash Box was a rival publication to Billboard, never as widely read but certainly using credible outlets to figure their own chart placements which tended to vary slightly with Billboard but not SO much as to make either one seem alien to the other. I know what you’re saying. FASCINATING STUFF! But what does all this talk about magazines and 1964 have to do with The Ravens in 1947?!?! Well, it all ties in. In our review on the flip side of this, Write Me A Letter, we pronounced that it was the first legitimate, authenticated HIT, as it made the Billboard race charts a few months later, the first such appearance by any rock record and thus a very notable achievement in the music’s rise to prominence. But it wasn’t the first rock record, nor even the first Ravens record, to make ANY chart. The Ravens had already charted on Cash Box with their release from last June, Ol’ Man River, which just pre-dates the rock explosion, AND they would score with another song besides Write Me A Letter on those same charts before “Letter” inched its way onto either Cash Box OR Billboard. Care to guess which song? That’s right. It’s THIS one (see, stick with us long enough and we’ll eventually wander back to the point of all this!). Summertime made the Cash Box “Harlem” charts, on November 22, entering at #7 and rising to #1 (yes, Number ONE! ), holding onto that position for two weeks as its flip side, Write Me A Letter, rode its coattails into the Top Ten, then passed the sinking Summertime the week after, ironically just as winter arrived. “Letter” would spend the last two weeks of the year at #3 before dropping down as well. Now it needs to be pointed out what this means. Summertime was NOT the most popular black record in America, only in Harlem, or more specifically, whatever retail outlets Cash Box polled there. In other words, theirs was a regional chart, albeit significant in that the surviving resources for ANY type of demographic polling circa 1947 is alarmingly low and it DOES show something worth noting – namely that The Ravens were huge in the biggest city in America. For the sake of comparison back in October Cash Box began to also publish a “South Side Of Chicago” chart as well and by contrast The Ravens didn’t make an appearance there at all. Seventy years down the road these yellowed wrinkled pages from a handful of magazines give us a bit more insight into the music world as rock ‘n’ roll began to crawl around the nursery for the first time. Somewhat surprisingly it’s kind of a mixed bag and considering their inventive re-working of Ol’ Man River, which was enjoying its greatest success as they stepped into the studio to cut this, it’s rather shocking that they didn’t even try and come up with something a bit more… well… interesting. While there’s nothing glaringly wrong with this, there’s nothing memorable about it either and that in of itself is just hard to comprehend considering who we’re talking about here. The Ravens, by virtue of their distinctive lineup with their bass singer, Jimmy Ricks, out front and the contrasting voices – especially high tenor Maithe Marshall – made their unique vocal arrangements the centerpiece of their sound. Everything was designed around making sure that those components were highlighted in vibrant, often startling, ways. Yet here they deliver a pretty straight-forward rendition that is lacking in imagination even as it never skirts the edges of being bad or anything. Clearly Ol Man River was on all of their minds when recording Summertime and so it’s almost expected to hear the same precise blueprint for the intro with its basic stabbing piano laying down a bed for the voices to chime in with a similar sounding refrain – “Do-do-doot” – leading into Ricks’ dramatic entrance. All well and good but it’s just a warmed over rehash of something they’d recently done better and so already we have the first warning sign that this record may not be taking many chances. Things pick up momentarily fifteen seconds in when the others harmonize wordlessly behind him, their voices so pure and effortless that it’s a shame when they return to the clunkier Do-do-doots again. Their doubling of Ricks on “Hush little baby” that follows though absolutely sparkles before once again they recede back to the shadows a bit. It’s those types of passages we want to hear more of and with a song this good – written by George Gershwin no less – frankly that’s what we’re expecting. But that’s not what we get. Instead they play it close to the vest, giving us their basic roll call of standard tricks without much personal investment attached, almost as if this were a rush job, or just something they didn’t take all too seriously. Were they wary of being cast as a group whose “gimmick” was shaping up to be transforming songs from Broadway musicals into records made for the charts? Who knows, but there’s definitely a slight disconnect between them and the material that keeps surfacing throughout that’s hard to explain without contemplating their mindset a bit. Its weakest moment ironically happens at a point where they usually attempt to shine. In most of The Ravens work they come up with a distinguishing feature to highlight the dichotomy of their voices, yet here they wind up falling flat when they do. In this case it’s designed to showcase Marshall’s high voice, yet because the others are the ones singing the lines themselves it leaves Marshall to soar over them like a balloon at a county fair held by a restless six year old. Pretty soon the balloon and Marshall slip away completely and just ride the breeze wherever it takes them. Poor control on his part combined with rather soulless vocals by the others here deep six any momentum they’d been building leading up to this. Yet they’re still skilled enough to reign things in when they have to, as Marshall instantly redeems himself by echoing Ricks on the line “baby don’t you cry” showing why the two of them, when working in tandem, could be so hard to beat. As if on cue they pull off the subsequent shared group vocal with understated grace leaving you to wonder why nobody noticed the difference in quality between the two sections and asked for another run through and maybe a hasty re-write to smooth that first section out some more. Coming out of this Ricks, who had stumbled earlier quite a few times, butchering the word “morning” by trying to stretch it out into seven syllables, now starts to dig deeper and comes up with a signature moment while emphasizing the “your daddy’s rich” so you can almost see the dollar signs in his eyes. It’s the kind of line he was made to deliver and yet because it works so well it also serves to highlight what doesn’t work at other points in the song. I realize I’m probably coming off as too harsh here and I don’t really mean to. It’s certainly not bad, but with all of the weapons they have at their disposal they seem uncertain how to best use them to the song’s advantage to the point where even Ricks seems hesitant to add anything of note. Only in the ad-libbed spoken coda, which is the one point that was sure to offend traditionalists, does he step outside of the expected and puts his own stamp on it but by then it’s too late to raise this above average. On the whole their performance is just too up and down, too unfocused and more than anything too predictable. Despite my somewhat sharp critiques on its flaws, which is part of the job here remember, the overall record is okay as evidenced by the respectable score. It’s not worthy of being a hit by any means, but they turn in an effective rendition, a mildly pleasant rendition even, just not a transcendent one. Nor even one that strives to be more than just serviceable. In the end they deliver just enough of what they have to do to pull it off but nothing more than that to make it memorable and for a group that has such potential for delivering performances of striking originality with anything they tackle each time they open their beaks, to hear something that is merely content to be “okay” is more of a disappointment than a criticism. 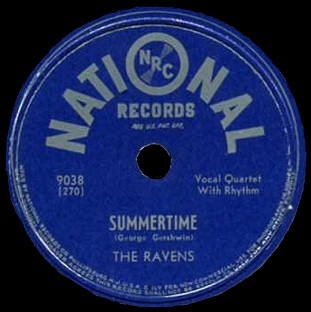 Leave a reply on "The Ravens: “Summertime”"